Crib mattresses are too often selected only on the basis of cost and whether or not it fits in the crib you already own. Here are reviews for the 7 best crib mattresses for your kids. We’ll share the pros and cons for each mattress and explain how each of these mattresses differs from each other. The Sealy Baby Firm Rest crib mattress contains a durable network of steel coils, while the borders and support system ensure the coil never poke through to harm your child. The anti-sag system guarantees that your child will not suffer breathing problems by sinking into the mattress. It has a hospital grade waterproof surface. You don’t have to worry about poop and vomit seeping into this mattress, creating a long-term health hazard for your child because mattresses like these are impossible to wash. The company says the mattress is Greenguard Gold Certified, not outgassing harmful chemicals that you may smell when you buy a new mattress full of plastic and artificial materials. However, this is not nearly the issue the manufacturer makes it out to be. This mattress has passed nearly every industry quality test around, and it meets and exceeds industry safety standards. It fits U.S. standard cribs and toddler beds. This mattress is safe for newborns and can support children up to 99 pounds. The manufacturer offers a 20 year limited warranty, though this is not available through all sellers. The mattress itself weighs about thirteen pounds. This is one of the best crib mattresses for those who want to go all organic and all natural from the start of their children’s lives. This mattress uses a core made from soybeans instead of the standard chemicals and plasticizers used to make memory foam mattresses. Yet it resists sagging even after years of use. The foam itself is free of phthalates and other chemicals necessary to make other mattresses this soft. The mattress’ surface is water proof. The surface is stain resistant but not stain-proof. A mattress protector is recommended but not essential; you don’t need it if you have sheets on top of the mattress. This mattress meets and exceeds U.S. safety standards, and it is very highly rated on many environmental standards. This mattress, too, is GreenGuard certified, since it is BPA free. This mattress weighs only eight pounds by itself. It isn’t rated to support older children; it is only rated to support a child up to 65 pounds. This is an affordable, basic infant mattress. Why include it in a list of the best crib mattresses? Because this mattress was given the 2017 Women’s Choice Award. It doesn’t come with a removable cover. This mattress is hypoallergenic. It fits standard sized infant and toddler beds. It vinyl cover makes it water resistant and more durable than other mattresses in the same price range. This mattress is only rated up to fifty pounds. It comes in a variety of colors, though not all vendors offer all colors. It weighs less than eight pounds itself. One downside of this mattress is that it won’t last for years. If the plastic exterior starts to rip and crack, replace the mattress. This mattress is a top selling crib mattress. It is designed for both cribs and toddler beds. It is lightweight and affordable. One interesting detail about this mattress is the fact that it is compressed when shipped and takes three days to fully expand. Conversely, this reduces the shipping costs. This mattress has a water-resistant inner lining but you’ll want to put a mattress cover on it. The mattress itself is resistant to static and bacterial. It is a foam mattress, but it is free of phthalates. It is made of lightweight and breathable cotton. If you live in a hot climate, this mattress will keep your child cooler and comfortable longer than other mattresses. In a few cases, the mattress doesn’t expand evenly, and then it is a problem. This is another affordable traditional crib mattress containing heavy gauge steel coils. This mattress fits standard large cribs and toddler beds. Both the surface and the edges are waterproof, while the lock-stitched edges almost never fray. Just wipe it clean if the baby spits up on it. A side benefit of the tightly stitched seams is that the mattress never pops and falls apart because of children jumping on the bed. This mattress meets and exceeds flammability resistance standards. It is a Greenguard Gold certified product. The top layer is hypoallergenic. One downside of this crib mattress is the unusually limited ten year warranty. It is rated to support children up to sixty pounds in weight. Another issue is its tendency to sag after a year or two of heavy use. The mattress itself weighs about 12 pounds. This firm foam mattress has a built in memory foam top to combine support and softness so that parents can put the child down to rest and maximize the time they sleep there. The fact that no chemicals are used in its manufacture makes it attractive to the eco-friendly crowd. This mattress resists bacteria, mold, dust mites and allergens. 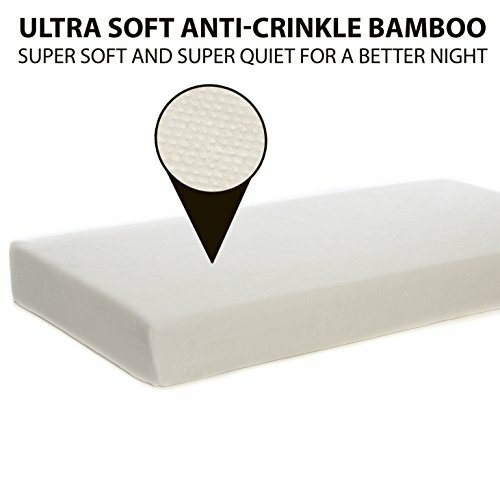 This crib mattress comes with a machine washable bamboo cover for those who want to protect the foam mattress from biological messes like vomit and poop. Replacement covers are available. The manufacturer says the cover is water proof. In reality, it is water and stain resistant. The mattress can last for years. It weighs twelve pounds. Note that if the liner breaks, the mattress will then absorb biological messes and become a true hazard; in that case, it should be thrown out. We realize that not everyone is using a standard sized crib with plans to graduate to a toddler bed. This two inch thick mattress is designed for portable cribs and mini-cribs. For example, this is the best crib mattress for putting in a bedside crib next to the parents’ bed. It is 24 inches by 38 inches. The surface is stain resistant and waterproof, hypoallergenic and antimicrobial. It comes with only a one year warranty, but it isn’t likely going to be used much.